Day after Samajwadi Party founder Mulayam Singh Yadav supported Narendra Modi as the next PM and said that he would like to see Narendra Modi return as prime minister after the 2019 Lok Sabha elections, the Bhartiya Janata Party (BJP) in Lucknow has put up posters thanking Mulayam for his comments on Modi. 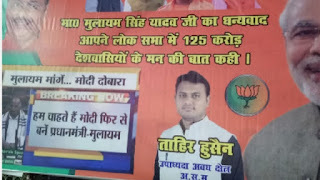 The posters have been volunteered by BJP's Minority Wing leader Taahir Hussain reads, "Thank you Mulayam Ji, you said what 125 crore people of the country feel." Poster put up in Lucknow thanking Mulayam Singh Yadav for his "I wish you (PM Modi) become PM again" remark in Lok Sabha-ANI reported .